← Are you strategic, or just efficient? Want to achieve more, rethink what you’re measuring. “It was the best of times, it was the worst of times.” Charles Dickens may have been onto something about measuring in the 21st century way back in mid-1800s. With the plethora of information, tools, and technology, we can figure out how to measure just about anything—the best of times. But with so much to measure, are we measuring the right things that will truly enable us to achieve more—the worst of times. Before I jump into measuring, I want to define some terms. I’ve found the definitions for a goal, lag measure, and lead measure in the book The 4 Disciplines of Execution by Chris McChesney, Sean Covey, and Jim Huling to be quite helpful. GOAL (from X to Y by when): Decrease total body weight from 190 to 175 pounds by May 30. LAG MEASURE (ultimate measure of success): Weight on the bathroom scale. What activities can I measure to track my progress in this situation? LEAD MEASURE (predictive of achieving the goal and that you can influence): A) reduce calories consumed, and B) increase calories burned. These two measures (calories consumed and calories burned) strongly indicate if you’ll lose weight (note, strongly indicate not guarantee), and they are directly influenceable by you. Unfortunately, leaders spend most of their time fixated on lag measures, even though you can’t directly affect them. Lag measures tend to be more visible and easier to define and obtain. As an example, it’s easy to measure your weight, just step on the scale. However, measuring the number of calories consumed and calories burned, every day, not as easy and requires discipline. But isn’t that how we really lose weight? It’s easy for someone in sales to tally the number of sales for the month (lag measure), or for a fundraiser to total the number of dollars raised last quarter (lag measure). 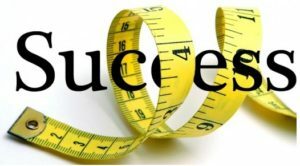 Lag measures tend to be the response to “What does success look like?” Don’t’ get me wrong, we need lag measures; they point the direction. But achieving those lag measures happens because we know what lead measures will significantly increase the odds of actual achievement of our goal. I believe that understanding and focusing on lead measures can determine the difference between someone being promoted or overlooked, or an organization that moves forward or remains stagnant. This is a significant reason why, I think, the majority of strategic plans fail, or at least never gain any traction. We determine goals (lag measures), and then develop a “to-do list” of objectives. But the objectives many times are not directly tied to lead measures. It takes time, and effort, to determine the best lead measures, especially in an era when we have the tools and technology to measure almost anything. Want to achieve more, re-think what you’re measuring.